Sometimes, you just need to make a bad thing badder. If you're going to go completely all out, devil may care, full pelt gluttonous, then you may as well do it right. Go big or go home, that's what I say. 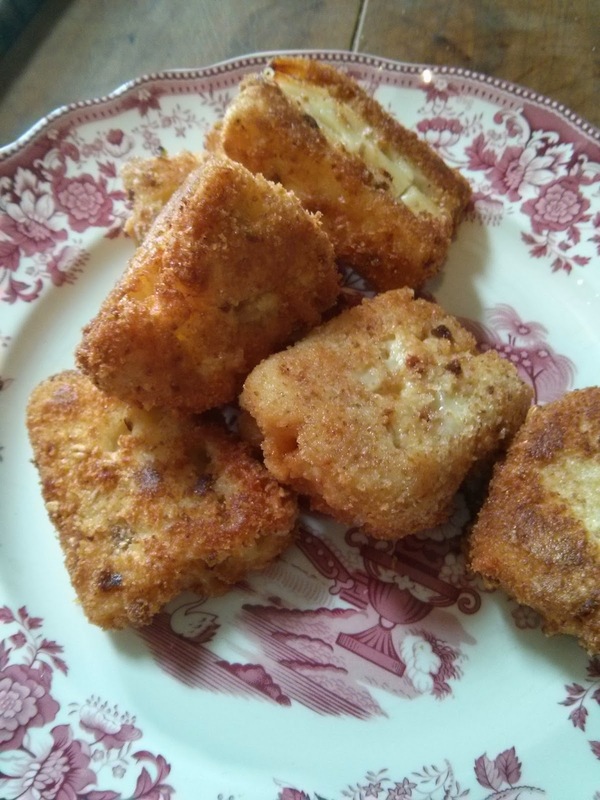 I'd heard whisperings about deep fried macaroni cheese a good while ago, I can't recall where. At first, I was appalled. It sounded like the kind of thing that fitted in at a state fair in Texas, along with deep fried butter and battered batter. But then I thought about it. God, I love macaroni cheese. 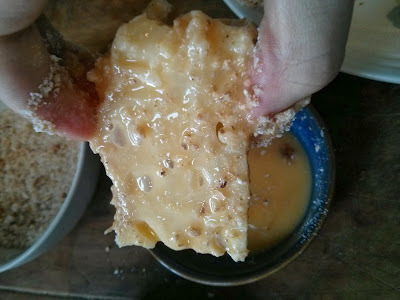 Its oozy, cheesy, rich buttery warmth just feels like a hug to my insides. It's the ultimate comfort food, and I will always be in the mood for it. And isn't my favourite part the crust on top? 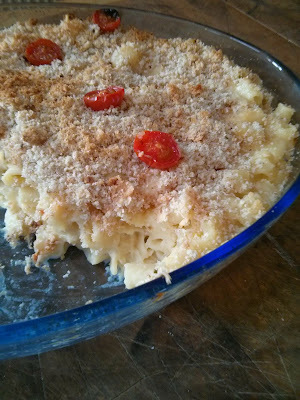 I need a good breadcrumb and cheese crunch to contrast with the creamy pasta, so I always have a good thick topping. 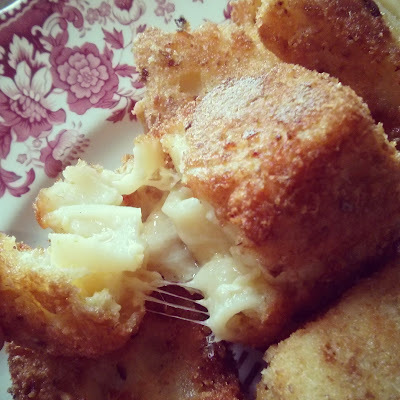 So surely deep fried macaroni cheese would just give me more of the topping that I love? It didn't leave my thoughts for a long time. I started to see it popping up in restaurants (though not ones I was in, unfortunately). 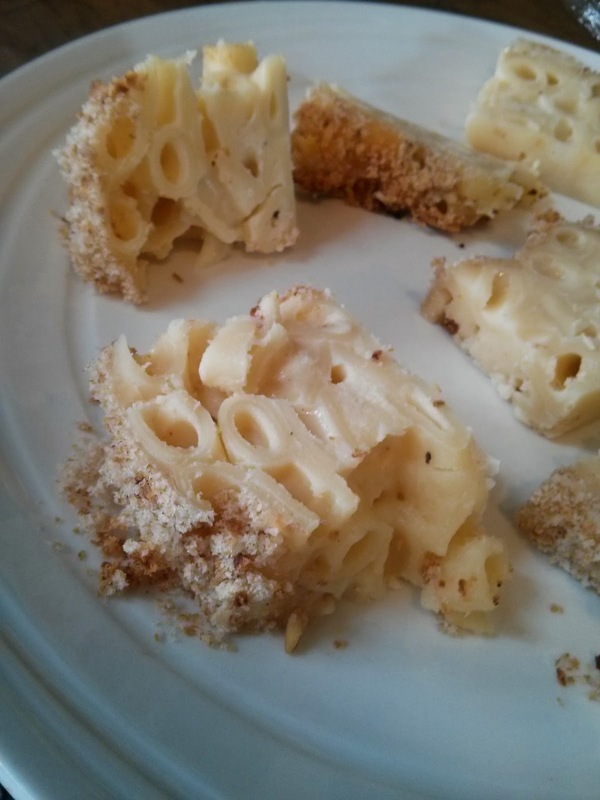 The London popup restaurant When Mac Met Cheese. Chosen Bun in Fulham. Had I seen it on a menu, I would have snapped it up in a flash. But alas, I didn't. And, last Sunday, I found myself in the blissful position of having a lazy morning and leftovers. I decided that enough was enough. It was going to happen. I took my leftovers from the fridge. 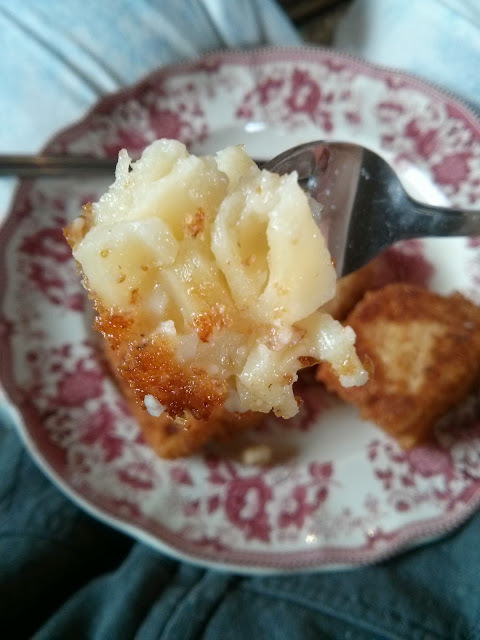 I wouldn't bother making macaroni cheese just to make this - just make a super big batch to make sure you have leftovers. I always make more than I need. It's really important to have this cold - if it isn't straight out of the fridge, pop it in the freezer for 30 minutes. Cut into chunks. I made mine more slices, but I've seen recipes where they're rolled into balls, or cut into tiny squares. I figured the bigger the chunks, the less faff frying. Also, I could lay them flat in the pan, so I didn't need as much oil. 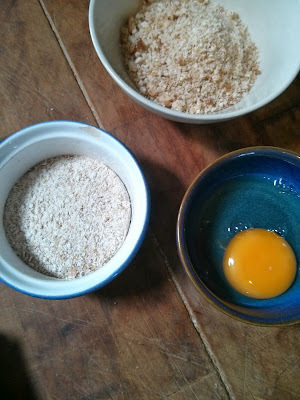 Gather some flour, breadcrumbs and whisk an egg. Season the flour and breadcrumbs well with salt and pepper, and herbs/spice if you fancy. Heat some vegetable or sunflower oil in a deep frying pan over a medium heat, only a quarter of the way full. I should point out that I HATE deep frying. The smell makes me gag, I'm terrified of burning myself, and it just looks grotesque to me. Yuck. Dust each chunk with flour, then dunk in the egg and coat well in the breadcrumbs. It's easier to do all of these and put them on a plate, rather then putting them straight into the oil one by one. Back to your pan. When the oil is hot enough (a breadcrumb should fizz in the oil, but not brown instantly) you're ready to fry. Be careful not to burn yourself, and put each piece in one by one. They only take a minute or two on each side. When the bottom is golden, carefully flip them over. 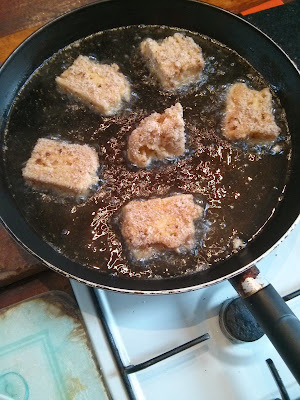 The oil should have reached half way up the chunk, so they are golden on all sides. Rest on a couple of sheets of kitchen roll to drain off the disgusting oil, and leave them to sit for a minute or two. What you're left with are crispy little hunks of cheesy goodness. If you wanted to be extra fancy, you could smuggle some extra mozzarella into the mix, for extra ooze. What's really nice is some cherry tomatoes through the macaroni, which cuts through the richness. But you're not going to do anything fancy when it comes to serving these, let's be honest. They're too rich to call for anything else, and salad on this plate is just a ridiculous sham. This is the kind of food you eat in your pajamas, watching The Office, when you know no one is calling to the door. Then when you're done, wash your hair, throw out your oil reeked clothes, disguise all the evidence and PRETEND THIS BEAUTIFUL MOMENT NEVER HAPPENED. That looks amazing! I really should stop eating macaroni cheese... but that's not going to happen.